Your home can make you feel great every time you see it with exterior colors that compliment you, your surroundings, and the way you live— and add value to your property as well. While we specialize in Historic Homes we also work our magic on all styles of homes including tract homes and brand new homes. Working through the mail, utilizing photos or blueprints, and using your input through our famous questionnaire, The Color People can take the fear out of choosing colors for your home or commercial building. 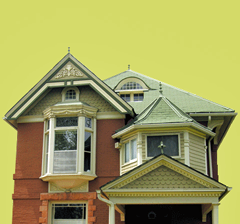 We also have a mail order service for Historic commercial buildings such as store fronts and B&B’s. The Color People are color consultant pioneers providing color design services to developers, builders, architects, property managers, and home owners. Our clients come to us when they are in need of a color consultant for exterior paint, historic house color, specialized interior color, and product color for both building and retail markets. Owner James Martin started the company in 1979 and was an originator of the movement of Architectural Color Consultants and the first color consultant to offer color design services nationwide through our now much copied mail order design system. We have work in all 50 states and numerous foreign countries. After 30 years as color consultants we are widely regarded as authorities in the new field of architectural color. We have written for and and been featured in books, major magazines, newspapers, and television shows all over the world.